Price: Mil naengmyeon:5,000 won/6,000 won; Bibim mil naengmyeon:5,000/6,000 won; Suyuk: 9,000 won. 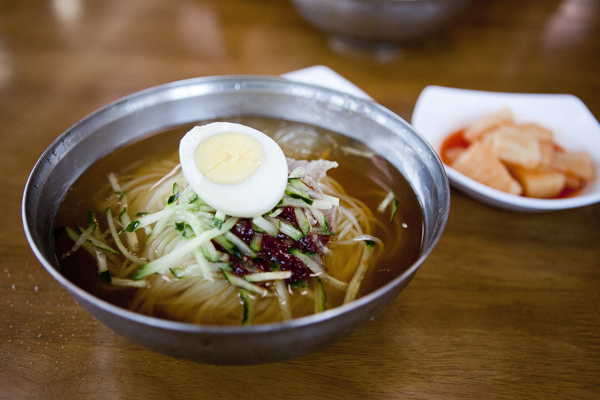 Menu: Mil naengmyeon are cold (naeng) wheat (mil) noodles (myeon) served in an icy cold broth, along with boiled egg, slices of pork, slithers of cucumber. and red pepper paste. Bibim mil naengmyeon comes without the broth. Don’t be fooled by the thinness of the noodles as scissors are needed to cut the stubborn bowlful into suckable strips. A plate of pork - suyuk - is also available. Taste: This Moseulpo restaurant was so famed that a second outlet was opened in Gu Jeju. Cold noodles can’t be beaten for a light lunch and in summer there are few things as refreshing. Walk in sweaty, walk out classroom-ready. Interior: Tables and chairs laid out to accommodate as many as possible. Even so, at lunchtime you will have to wait a few minutes to get a seat. Staff: Family-run and non-stop work in the kitchen. Directions: Traveling south past Beobwon Sageori (the law court junction), take the first right after Jeju Fire Station (Sobangseo). The restaurant is on the right after 100 meters. Standing to the north of Daejeong Chodeung Hakgyo (elementary school), walk a few meters to the west and the restaurant is on your left.